I have a short term project that I need help with. OB/GYN audit. Coding needed for approx 50-75 operative reports. Must have OB/GYN coding experience. Please contact me if you're interested. Experience in OB/GYN only please. Where is this job located? I am located in Hummelstown, PA. I love OB/GYN coding and actually helped revitalize one of my local hospitals OB/GYN practice. We used moonlighters, residents, midwifes, and every other type of physician. I would love to help you out. I am currently not working, so I can start right away. Please let me know. You can call me at (717) 315-0538 anytime. I would be interested in the Tempory Coding position. I have 9 years OB/GYN coding. Please let me know the details and where you are located at. Certified help can be on the way! I am CPC certified and my area of expertise is OB/GYN. I have coded, billed and followed-up in private, MDCR and MDCD insurances for two large OB/GYN practices as an independent consultant and actually saved one of them from a pending bankruptcy. Currently, I am getting involved with compliance issues as well. The changes are amazing, not to mention the upcoming ICD-10 bombshell. I guess that qualifies me for a geek! I love learning about this stuff! If you are still in need; send the claims over, and I can have a look at them. P.S. AAPC has me as CPC-A which is ridiculous; but it is a bit difficult when you are self-employed. You don't think to say, "Hey, by the way, could you please write a letter stating that I did all of this for you." This will be corrected very soon. I honestly, have 8-10 yrs with the OB/GYN's. Can anyone tell me how people get the CPC-A??? I took my CPC exam last saturday the 10th and im waiting for my results!! Just wondering to know how do you get the CPC-A? I also took the exam on 10th. As I understand it, if you see the CPC-A behind your name when you login to check results, it means you passed the exam and are now an Apprentice (A). Once you prove 2 years of work in the business, or get a letter from your employer stating you have coding work experience, the A (apprentice) is taken off the designation. Good Luck! Everyone responding to the post about a short term project for OB-Gyn Coder should look at the date of the original post. It originated in Sept 2010...I think the project is probably done by now! 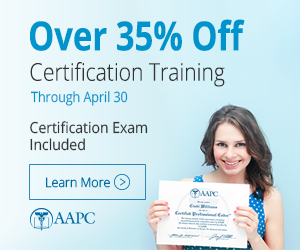 The A means apprentice, meaning you are taking the CPC exam and have no real world "on the job" experience that has been documented and proven to the AAPC. I have proof of one year of experience and 78 hours of volunteer work at the medical coding department at Fort Gordon. I am currently working with Georgia Medicaid.